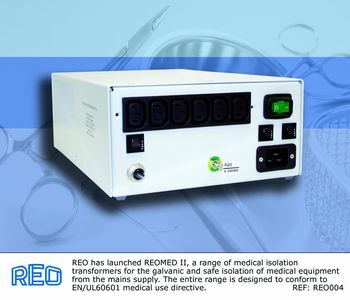 REO has launched REOMED II, a range of medical isolation transformers for the galvanic and safe isolation of medical equipment from the mains supply. The entire range is designed to conform to EN/UL60601 medical use directive. Medical isolation transformers reduce the risk of electric shock to people who may already be in a compromised state of health, by removing the connection between neutral and earth which exists in a normal un-isolated system. Virtually every piece of equipment destined for use in a medical environment needs isolation from the mains. REOMED II is the latest generation of medical isolation transformers from the REO Medical Sector for operation at 1000 - 2200 VA. REOMED I has already been externally tested and achieved the standards IEC/EN60601-1/A2: 1995, IEC/EN60601-1-2:2001, UL60601-1 and CSA C22.2 No. 601.1-M90 and REOMED II will be accredited shortly. Most medical equipment is manufactured and tested to incorporate an isolation transformer or even be totally disconnected from the mains, using power from battery packs instead. The decision is normally dependent on the class of the equipment (Class I or II) into which REOMED II is integrated and the class of any associated equipment. Other applications include the safe operation of endoscopy camera systems, picture archiving and communications systems (PACS), dental systems and electrically operated beds. The sturdy aluminium housings used on REOMED II ensures that the unit is protected against physical damage and against water/dust ingress. A secondary insulation layer provides additional insulation between primary and secondary windings to protect against breakdown to 4.4kV. Encapsulation allows better physical protection and less likelihood of insulation degradation with age. A thermal sensor ensures that the unit will cut-out in the event of an overload, and will restart again when cooled down. An earthed copper screen guarantees that leakage current is further reduced to well below specified limits. Providing fused live and neutral necessary for EN60601 compliance, REOMED II also delivers lower losses than conventional transformers, especially in no-load or low-load conditions. In addition, the low magnetic stray field of the product means it is less likely to interfere with other equipment. A built-in inrush current limiter prevents fuses from blowing on start-up and requires only a minute to reset. If the unit needs to be started or stopped quickly or multiple times, then REO recommends an electronic soft-start variant. Options are available for additional EMC filters. Furthermore, REO can also supply the standalone medical grade toroidal transformer for integration into OEM equipment.